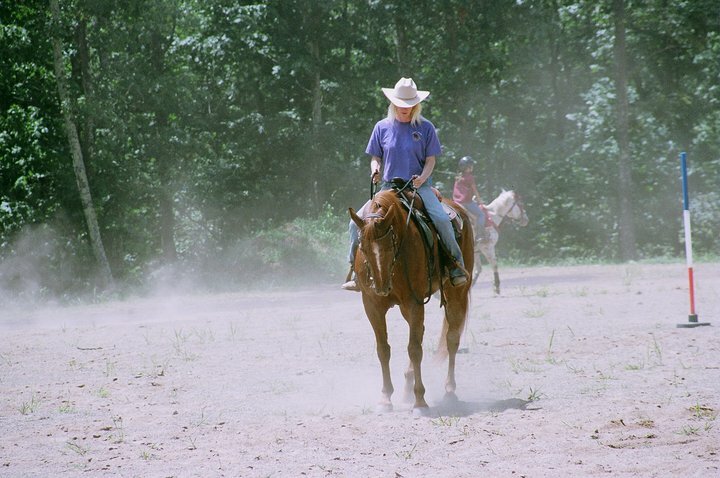 Owner/Horse private 2 hour session - $150.00 - Wendy will work with you and your horse with whatever help you need, even if it's simply a matter of building your confidence with your horse. These sessions are private and confidential. .
At Tanament Stables we focus on foundation training – not only for the horse that is being trained but for the primary rider. Whether you are riding English or Western, foundation training begins on the ground, continuing under saddle, and remains critical even after a rider dismounts and simply leads their horse back to the barn. A horse is an athlete in training that must not be pushed to a higher level before it has the strength, flexibility, calm mindset, and coordination to perform maneuvers that become increasingly more demanding. While most people agree with this philosophy few recognize when they have pushed their horse too far until the horse becomes bad mannered, sour at their job, aggressive under saddle and/or lameness becomes an irreversible issue when, sadly, it could have been prevented. You have a Western background but my horse goes English, is that okay? Horses don’t know whether they go English or Western, and they don’t care. All they are looking for- and learning from - is the release of pressure. English or Western, the horse is brought to me because there is a problem. I look at the symptoms, find the actual problem, and teach a different and correct response from the horse. Whether you’re sitting on an English saddle or a Western saddle, the cues are basically the same, except for leg position – and we are all looking for a soft, flexible, respectful and mentally balanced horse. If the horse has a negative attitude that isn't properly addressed it will never reach its full potential. Why? Because reluctance in the mind is reluctance in response, and that translates to brace in the horses body. In turn, the horse is not focused on its job and, thus, the downward spiral. This is true for any horse in any riding discipline. I get all kinds of horses and horse problems here - and the problems actually have nothing to do with English or Western riding. For example, a mare was brought to me recently and, wow, did she have a lot of issues! I remember that the second I put the saddle on her she sullied up and dropped to the ground. I stood there and passively watched. When she stood up, I pet her on the head and told her she was a good girl. She just stared at me, a bit confused because it was clear that she had expected brutal tactics in return. This horse clearly needed help and confidence under saddle. I had worked a lot of her problems out on the ground, and though she was tremendously better, once that saddle was on her – in her mind – it was only going to lead to the torturous riding that she had experienced in her previous training. When I mounted her, she refused to move and even gave a small indicator that she would like to buck me off, but I knew she wouldn’t – she was too respectful, now, for that. What did I do? I just sat there - I didn't spur her or kick at her; I simply relaxed and talked to some people who were watching and explained what was going on. When I was 95% sure of the outcome I asked the mare to move; she did. In essence, it was through patience, instinct, feel, and knowledge that I addressed the issues of that particular horse, and that was the beginning of a perfectly fine and respectful horse today. She moves off the moment you ask and she stops clean and light. So, you need to get the English versus Western thoughts out of your mind. If you aren’t bringing me an unbroke horse, you are bringing me a horse with a problem. All frills aside, I'm working with the extreme basics whether it's an unbroke colt or a ten year old championship horse. When a horse needs training, I start at the beginning; I'm either searching out the foundational holes in a trained horse or building a solid and positive foundation for an unbroke colt’s future. To me, that’s horse training and that's what I provide. I ride English, and I don't want my horses head that low. No matter what discipline of riding, I never force a horse to lower its head to an unnatural position. What I do is calm the horse down and, through exercise and conditioning, the horse lowers its head naturally. As I tell my clients, head position has to do with horse conformation. If you are an informed buyer and have purchased a horse to train it for, let’s say, Dressage or Reining , it should already possess the desired conformation for that riding discipline. 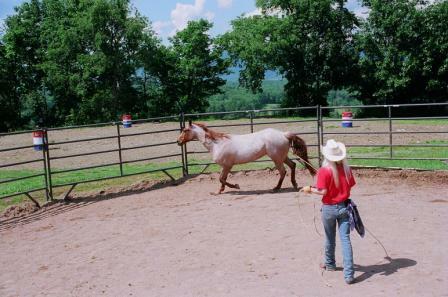 Most trainers only take a month to train a horse . . . Provided you’ve taken your horse to a good trainer, in a months time of training your horse will have a great deal more confidence and a general idea of what is expected of it, but you do not have a seasoned horse. The rest is completely up to you. If you don’t continue with the same repetitive and consistent training your horse will quickly become more reactive than thoughtful and you will likely be back where you originally started. A truly seasoned horse stays at the training barn/boarding stables for a year and often just end up boarding there because, for example, our facility provides the desired services such as a riding arena, round pen, trails, etc. That doesn’t mean that the horse is in constant training with the trainer, but problems are detected early and worked on in whatever manner trainer/client decide upon.